What If U.S. and South Korea Won't Negotiate With North Korea? 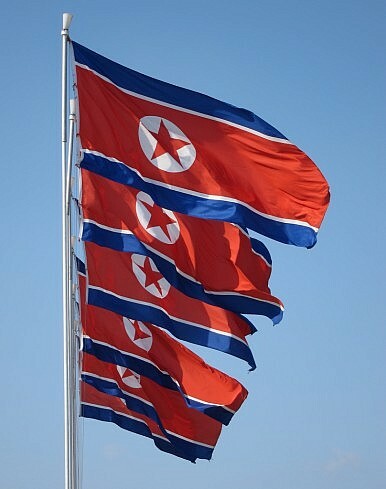 Pyongyang could find itself in an interesting situation, with only one solution. Recently, I mentioned one possible reason North Korea has decided once again to use bellicose language to create tensions with most of East Asia and the United States. This theory posited that Pyongyang is using tough talk as a way to get Washington and Seoul back to the negotiating table to extract some new concessions like food or economic aid. Based on detailed historical scholarship, such a theory is worth considering. Just today South Korea's unification minister explained that he hopes Pyongyang will come to the negotiating table concerning the Korean industrial complex at Kaesong. "The Koreas should discuss ways of normalizing the industrial park through dialogue," Unification Minister Ryoo Kihl-jae explained at a press conference. "Pyongyang should come to the bargaining table immediately." Yonhap did note that after the press conference “A unification official said the minister's statement is not Seoul's official proposal for talks.” However, it does appear Seoul could be open to the idea. As for the United States, there has been some talk of negotiations, but the North may not like the topics of discussion and it would seem doubtful they would take a seat at the negotiating table. The Obama administration has outlined a policy of “strategic patience” where provocations from the North will not be rewarded. “They have an option, and that option is to enter into negotiations for the denuclearization, which is China’s policy also, and to begin to focus on the needs of their people, which we also have made it clear we are prepared to help them with if they will bring their behavior in line with the United Nations and global community requirements” said Secretary of State John Kerry on last Tuesday. Despite the idea that South Korea might be considering talks, what would there be to negotiate? What would North Korea want for a return to the status quo of just a few months ago? If North Korea is truly trying to create another crisis all to gain some new concession, it makes sense that based on current U.S. policy and South Korean anger that there very well could be no talks in the near future. The North has broken its promises countless times, just recently in last year’s leap-day deal. Why would Washington or Seoul make the same mistake again? Rewarding bad behavior is simply bad policy. This leads to much larger questions: If North Korea is truly doing all of this to gain concessions to help sustain the regime, what happens if it has miscalculated and pushed a tired tactic too far? Put differently, what if Washington and Seoul are truly in no mood to deal for an extended period of time? North Korea is quickly running out of viable threats it can make and therefore may have to move from words to some sort of physical action, like a missile or nuclear test. News reports suggest North Korea has missiles ready to launch for what appears to be a test firing. While there is a natural temptation to explore what sort of deal could be made in an attempt to improve relations, history has shown time and time again that this well-worn path does not work. Pyongyang gets something it needs, tensions drop for a year or two, and then North Korea manufactures a crisis and we are back to square one all over again. Washington and Seoul must break this pattern of behavior by offering no incentives – or negotiations — for what is considered normal behavior by any international standard. Rewarding bad behavior will not create any type of long-term peace on the Korean peninsula. There could be an opening in the future for talks after current tensions begin to cool, but to continue such a pattern is counterproductive and dangerous. Here is where China comes into play. If the North can no longer extract concessions from others in East Asia, it may have to turn hat in hand to Beijing to gain immediate aid. It is well known that China subsidizes the regime’s existence through large amounts of fuel and food aid that it could not survive without. Could Beijing, using even greater leverage than it already has, end the current stand off? While it is clear China has not fully enforced past UN Security Council sanctions on its long-time ally, Beijing clearly has a strong incentive to rein in North Korean provocations that could accidently spark a conflict no one wants. Also, China does not want to give the U.S. a pretext to deploy additional military systems to the region or see Japan or South Korea beef up their own military might. Most of all, Beijing does not want to see trilateral cooperation deepen between these powers, or indigenous nuclear weapon states. Beijing may have even more of a role in the current situation than people realize if North Korea’s latest tantrum does not result in any later deal or goodies from the U.S. or South Korea. The next few weeks should prove very interesting if Washington and Seoul take a hard line.